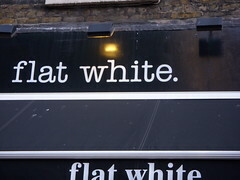 For me, no trip to London, should exclude a coffee stop at Flat White, 17 Berwick Street, Soho, London. On my third trip, I got a bit excited, snapping pictures for my website from the outside, inside, etc and even went as far as ordering a flat white coffee drink (similar to a caffe latte) and an espresso – I’ve never ordered two types of coffees before at a shop in one go and even the guys behind the bar looked at me strangely, but I thought, “I can’t come here and not order a flat white, and I can’t come here and not order an espresso from the pros” – so I did. I also managed to get a sit in their small, newly refurbished, but very full of ambience coffee shop. 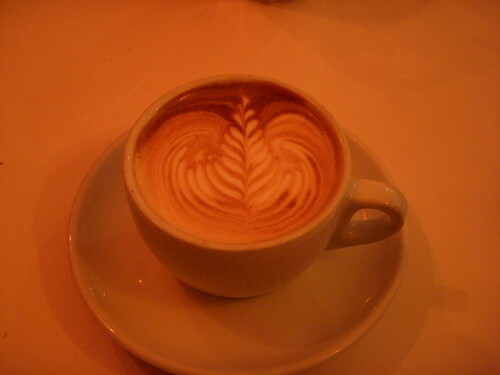 I lounged in the corner and snapped away at the beautiful rosetta latte art in my cup at different intervals as I drank it. I think people were looking at me thinking “he is either mad, hasn’t seen a cup of coffee before, or he is a journalist”, but it didn’t matter, I was comfortable and the wonderful staff at Flat White made me feel at home. I had the flat white coffee drink first (wonderful), then a glass of water to refresh my taste buds and then finished off with a sweetish espresso – their coffee comes from Monmouth Coffee. Flat White were recently voted “Independent Coffee shop of the Year for 2007” by ProjectCafe 6, now open everyday and have a website, so check them on www.flat-white.co.uk, where you can listen to music too. Definitely worth a visit. This entry was posted on Thursday, December 13th, 2007 at 12:51 pm	and posted in Bean There - Cafes. You can follow any responses to this entry through the RSS 2.0 feed.